Inspired by the Hank drum of Dennis Havlena (which in turn were inspired by the Hang), comes the ‘Gombadrum’. A German-made steel tongue drum born in Berlin, that like most Hank utilises a pentatonic scale, and an intuitive note layout, to create an instrument suitable for both professional musicians, and those with no musical training what-so-ever. Played with hands, or mallets, usually with the Gombadrum placed upon the lap. Those who play conjure forth ‘billowing soundscapes, and melodic meditative rhythms'. And like the ‘Milltone’ (and several other steel tongue drum), the Gombadrum also features a magnetic tuning system, to allow owners to re-tune their instruments themselves, saving on costly shipping charges. With standard model Gombadrum featuring eight tuned tongues, that produce a nice wind-chimey kind of sound. The Gombadrum sells for around the 400 Euro mark (at time of writing), and is available in a variety of scales, from ‘D Minor’, through to ‘Ahava Raba’. And like the ‘Sphaira’, and the ‘Klangauge’, the Gombadrum makes for a particularly attractive option for those located within (or close to) Germany. To minimise those ever costly shipping, and import tax charges. Visit the Gombadrum website: HERE. 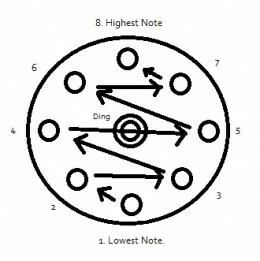 There’s something interesting going on over at the KorgForums, where a group of Wavedrum enthusiasts have set themselves the challenge, of trying to reproduce the sound of the PANArt Hang, on their ‘dynamic percussion synthesisers’. Looking like a futuristic Conga, the Wavedrum is a programmable, heavily customisable, electronic instrument. That has won numerous awards, and has drawn international praise for its organic interface, realism, and comprehensive arsenal of percussion sounds from around the globe. It's kind of like the old electric drum kits many of us would have had as kids, brought up-to-date, with a highly responsive, sensitive playing surface, and far more realistic sounds. However, despite the Wavedrum’s awesomeness. Recreating the sound of the Hang has proven to be difficult, even for the makers of some of the new wave of HandPan. So reproducing the complexities of the PANArt Hang’s tones in electronic format, was never going to be easy. And while (see video) the sound achieved so far isn’t perfect, it seems fair to say that the sound is Hang reminiscent. And being still a work in progress, it’s certainly an effort to be applauded.
. Or if you’re already a Wavedrum owner, head on over to the Korg Forums: HERE. And see what YOU can come up with. We’re not entirely sure what the deal is with the ‘Mood Drum’, by ‘Rovi’ (having not played one). But it is considered to be something of an enigma, within the steel tongue drum world. Tuned by the ‘soul’, rather than to any specific scale. In a manner presumably, not dissimilar to that of the PANArt ‘Free Integral Hang’. i.e. an instrument that is in tune, essentially, only with itself. The Mood Drum, by Rovi, is described as being ‘organic’ in nature. Created by ‘Ivor’, the Mood Drum is of solid build, and the standard model features eight (sort of) tuned tongues. And there are also limited edition models available from time to time featuring upto thirteen playable tongues. Designed to lift the players mood, through a barrage of colliding notes, and sonic resonance, the Mood drums sound, and playing style, would seemingly lend itself well to introspective meditative play, and/or musical therapy. So if that’s the sort of thing you’re interested in, the Mood Drum could be just what you’re looking for. And with an RRP of around the £200 mark, but frequent listings on eBay with starting prices as low as 99p, with which to grab a bargain. Rovi’s Mood Drum, could work out to be a great budget alternative, to some of the higher priced Hank-style tongue drums on the market. Especially if you're based within the UK, where postage costs will be minimal compared to shipping in alternatives from abroad. If you’re a Hang / HandPan player or fan, looking to show the world just how much you’re in love with your harmonic disc. 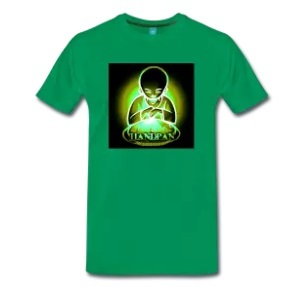 Or you’re looking to buy a gift for the dedicated HandPan musician in your life, you could do worse than paying a visit to our HPM Spreadshirt store. 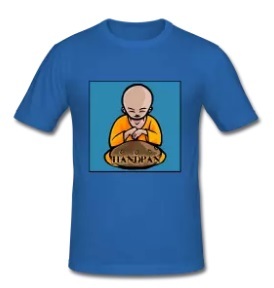 Where you can find a variety of shirts and garments decorated with our Buddhist monk inspired "Handpan Monk" logo. Spreadshirt is an award-winning online marketplace that specialises in custom-designed merchandise. 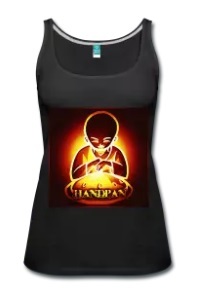 And the Handpans Magazine store features a selection of reasonably priced Handpan-inspired designs for both him, and her. From our classic "Buddhist Blue" and "Fire Monk" designs (featured below), to our "Toxic Green" design (pictured above-right). In addition to wearable garments you'll also find mugs for your coffee / tea / hot beverage of choice for sale. And as always, a big "thank you" in advance - as the commissions we earn via our Spreadshirt store enable us to keep this website up and moving forwards.